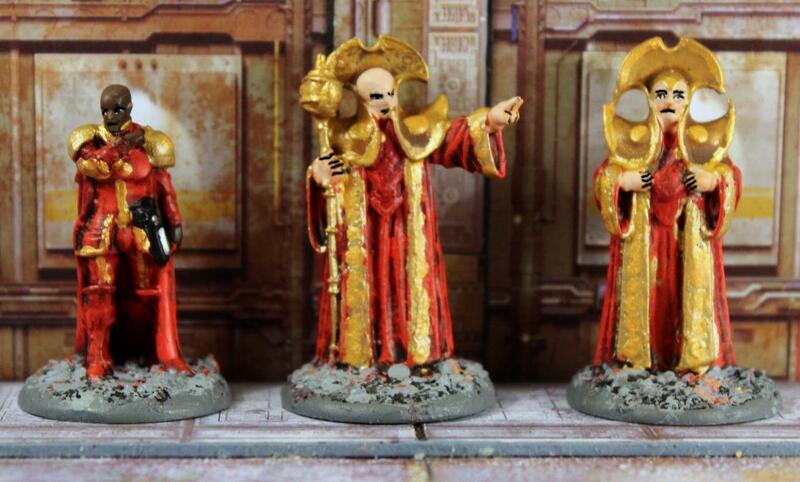 Here are three more figures from the Warlord Games' Doctor Who range of 35mm scale figures - the Time Lords. Gallifrey, the home planet of the Time Lords, stands in the constellation of Kasterborous. The Time Lords invented space and time travel machines known as TARDISes but closely monitored their use to ensure time was neither abused nor history changed. They had a strict policy of non-interference in other planets and their cultures. Thought destroyed in the Last Great Time War, the Doctor's home planet was actually frozen in time and shifted into another parallel dimension. In the Citadel, a giant structure enclosed within a glass dome in the main city, Lord President Rassilon and the Time Lord Council watch over their home world. From left to right are a Time Lord General, President Rassilon and a Time Lord Councillor. These are very statically posed, which is appropriate for their characters. I'm not sure how much use I'll get out of these figures but I still like them. This set of three figures, which includes six cards for the Exterminate! skirmish game, costs £13.00. Thanks, Dave. I can understand what you're saying - they're not an essential purchase, are they? Lovely eye-catching mix of gold and red, Bryan. 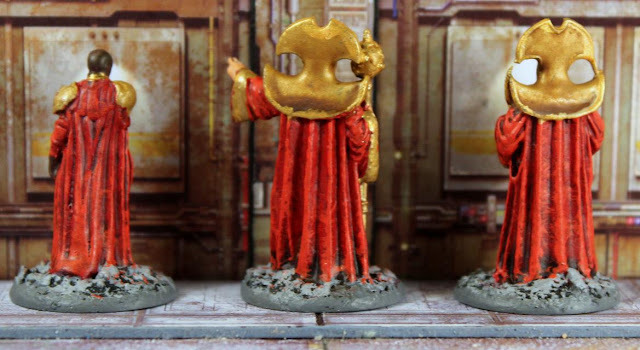 Will you be getting the Gallifreyan Guards when they’re released to accompany them? Thanks, Simon. I certainly do hope to add the Gallifreyan guards to them. A cracking bit of work Bryan. Oh yes, very nice indeed. Possible crossover uses as wizards for a fantasy game if one were so inclined ... obviously not the lady with the blaster. Cheers, Phil. I must admit I had never thought of using them in a fantasy setting... probably because I play so few fantasy games. They could also work for generic sci-fi figures. Thanks, FB. I reckon they could. A big fan of the old TV series (Not the new). I must say you have done them justice. Thank you kindly, Clint. I think both series have their merits and flaws. It sure is, John. I just copied the box art. That's a great idea about using them in Pulp games, Hugh.